The difference between inferring the values of latent variables for a certain data point, and learning a suitable model for the data. The difference between extracting variances (inference) and learning the invariances so as to be able to extract variances (by learning the dynamics of the input space/process/world). The neuroscientific analogy might be short-term potentiation/depression (memory traces) vs long-term potentiation/depression. Consider the setting of a simple Gaussian mixture model. Here we can think of the model parameters as the set of Gaussian components of the mixture model (each of their means and variances, and each one's weight in the mixture). Learning is the process of, given a set of samples from the model, identifying the model parameters (or a distribution over model parameters) that best fit the data given: choosing the Gaussians' means, variances, and weightings. Inference is choosing a configuration based on a single input. Learning is choosing parameters based on some training examples. In the energy-based model framework (a way of looking at nearly all machine learning architectures), inference chooses a configuration to minimize an energy function while holding the parameters fixed; learning chooses the parameters to minimize the loss function. As conjugateprior points out, other people use different terminology for the same thing. For example Bishop, uses "inference" and "decision" to mean learning and inference respectively. Causal inference means learning. But whichever terms you decide on, these two concepts are distinct. The neurological analogy is a pattern of firing neurons is a configuration; a set of link strengths are the parameters. This looks like classic cross-discipline lingo confusion. The OP seems to be using neuroscience-like terminology where the two terms in question may have different connotations. But since Cross Validated generally deals with statistics and maching learning, I'll try answering the question based on the common usage of these terms in those fields. In classical statistics, inference is simply the act of taking what you know about a sample and making a mathematical statement about the population from which it is (hopefully) representative. From the canonical textbook of Casella & Berger (2002): "The subject of probability theory is the foundation upon which all of statistics is built ... through these models, statisticians are able to draw inferences about populations, inferences based on examination of only a part of the whole". So in statistics, inference is specifically related to p-values, test statistics, and sampling distributions, etc. In case of traditional neural networks, k-NN or vanilla SVMs you have no probability density to estimate, nor assumptions about any density, thus, no statistical inference there. Only training/learning. However, for most (all?) statistical procedures, you can use both inference AND learning, since these procedures possess some assumptions about the distribution of population in question. When is a Naive Bayes Model not Bayesian? What is the difference between “inverse reinforcement learning” and supervised learning? 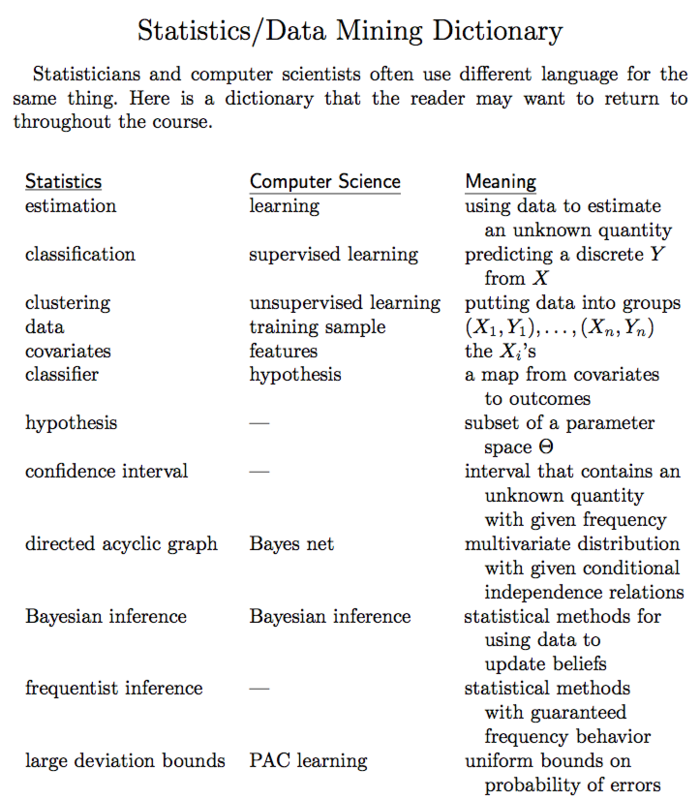 What is the difference between prediction and inference? Is there a difference between the terms statistical learning and machine learning? What is the difference between Econometrics and Machine Learning? What is the Difference between Inductive Reasoning and Statistical Inference? What is the difference between TD learning and TD search?